Computex Having largely failed to dent Intel's share of the netbook processor market, Taiwan's VIA is having another go, this time pitching a part at the nascent handheld internet tablet arena - and on the back of the ARM architecture. The chip in question is the Prizm 8510, a system-on-a-chip being released by a company called WonderMedia which is nonetheless a wholly owned VIA offshoot. The part was announced today at the Computex show in Taipei. The Prizm contains an ARM CPU, a GPU, a video decoding unit, its own memory and Flash storage controllers, handlers for all the hardware devive makers are likely to want to build in - display, memory card reader, keypad, audio, camera, parallel ATA storage and so on - and a USB 2.0 controller for other peripherals. 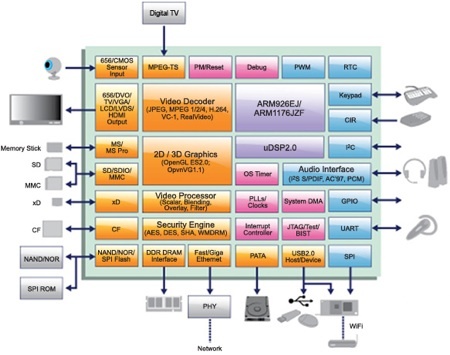 There's an MPEG-TS reader to handle feeds from digital TV tuners. Following the pattern established by VIA's x86 CPUs, the Prizm has on-board encryption and decryption hardware. Want it to do something else? Then make use of the programmable DSP core that WonderMedia has built in. It'll connect to 3G, Wi-Fi and/or Bluetooth hardware too. There's a Gigabit Ethernet MAC for wired networking, so it's clear VIA and WonderMedia want this thing in nettops as well as netbooks - it calls them "SmartBooks" - and MIDs. WonderMedia also has its eye on internet-connected photo frames, media players and other, embedded applications. All that will take it up against Intel's next-gen Atom platform, 'Moorestown', itself more of a system-on-a-chip than past Atoms have been. WonderMedia touted Prizm's "low power consumption", but wasn't forthcoming with details.